An inquest has recently been held at Worthing Magistrates’ Court into the death of Toby Woolford, a young man from Horsham, who died when his car collided with an HGV on the A27 near Arundel station. A man who saw a fatal road crash carried on driving because he did not realise how serious it was. Toby Woolford, 19, of Andrews Road, Southwater, was killed when his Vauxhall Corsa was involved in a collision with a lorry on the A27 near Arundel station. Christopher Howard, of Potters Mead, Littlehampton, told the inquest yesterday (Thursday): “I saw this car coming westbound down the hill. He had lost control and was in a skid, basically coming towards me. I still can’t remember if I took avoiding action, but he missed me. I looked in the mirror and saw the car go sideways into the lorry that was behind me. It did a little hop in the air and stopped. “The collision itself didn’t appear to be that great. I realised that I didn’t have a mobile phone. I saw a couple of people. I knew there were plenty of people behind the lorry so I carried on. My initial thought was ‘Wow – he’s lucky’ because the passenger side hit the lorry. I didn’t perceive it was a life-threatening accident. HGV driver Ben Nesbitt, of Middle Mead, Fareham, Hampshire, said he had been driving eastwards at about 30mph shortly after 7am on Thursday, August 25, last year. Angela Standing, of Norfolk Cottages, Warningcamp, Arundel, said: “I don’t know what made me look in my rear view mirror, but as I did a car behind me looked as though he clipped the kerb. I could see he was struggling to rectify himself (wrestling with the steering wheel), but he didn’t. The lorry driver didn’t have anywhere to go. Firefighters, ambulancemen and police soon arrived, but Mr Woolford had sustained severe head injuries and he died at the scene. Tests for drugs and alcohol proved negative. Quite obviously, a tragic incident – a young man dead, with his entire life ahead of him. A moment’s inattention, or carelessness, from Toby led to a unrecoverable swerve that resulted in his death. I don’t have a lot to say about this accident. What did strike me, however, is that although Toby died of severe head injuries – thankfully very quickly – the inquest did not discuss how Toby’s life might have been saved by something he could have been wearing, but was not, at the time of the collision. This is quite proper, of course; it would be unseemly to suggest or imply that Toby was somehow responsible for his own death by failing to use protective equipment while inside his car – a crash helmet, for instance. Such a helmet, similar to those worn by motorcyclists or racing drivers, could possibly have saved Toby’s life. On the other hand, it might not have. We simply don’t know. And it would be wrong to speculate about it. Especially because no driver, or any occupant of a car, would ever see fit to wear crash helmets while using their car for ordinary, day to day activities. It would be quite improper to talk about how Toby wasn’t wearing a crash helmet, even if there was a remote possibility it could have saved his life, because drivers are not expected to wear them. Bicycle users, on the other hand, are increasingly expected to wear helmets, with the attendant consequence that their failure to do so at a time when they are killed in road collisions is mentioned, quite often irrespective of any evidence that the helmet may or may not have been of any use whatsoever. When the Evening Standard reported the death of the cyclists Min Joo Lee at King’s Cross last year, their initial article contained the information that she was not wearing a helmet. This was hardly relevant, given that she was crushed to death by the lorry behind her (the story was quickly amended). The media are not alone in presuming the effectiveness of helmets for cyclists; the medical profession frequently sing from the same hymnsheet. Midlands Air Ambulance are, it seems, quite keen for cyclists to wear helmets, presenting us with a list of injuries suffered by cyclists who were not wearing helmets in their region, along with a list of injuries to helmeted cyclists that, it is alleged, could have been a lot worse had their helmets been absent. A man in his 40s who was airlifted to hospital from Evesham in Worcestershire who had a head injury that could have been a lot worse had he not been for wearing a helmet. A 60 year old man who was airlifted from Rugby who had suffered a severe head injury after an incident with a car. A 17 year old from Coventry ended up in hospital after suffering a serious head injury after a collision with a car – he wasn’t wearing a helmet. A cyclist in Wolverhampton suffered multiple injuries after a collision with a van. No helmet was worn. This latter group of people listed are quite obviously not very fortunate, but why their lack of fortune should be connected in any way to their lack of helmet when suffering ‘multiple injuries’, or indeed a ‘broken jaw’, is something of a mystery to me, given that a helmet does not protect the jaw, nor obviously the entire body. Nor, indeed, are the applicable standards for cycle helmets any indication of effectiveness in the event of a collision with a motor vehicle – and yet all these individuals listed by Midlands Air Ambulance were struck by motor vehicles. 0730 Debabani and James have already been called out to the scene of a collision between a car and a cyclist. The cyclist, who wasn’t wearing a helmet, has a swollen and bruised ankle. James, the paramedic, says the cyclist was lucky to escape without suffering any head injuries. James, I know you’re eager to get the message out, but you’re only making yourself look foolish by attempting to crowbar it in to a case in which someone has suffered an injured foot. The same goes for you, BBC. All this silliness – and it’s very easy to find – is, as I said above, a consequence of helmet use for cyclists becoming increasingly expected and ‘natural.’ ‘The cyclist’ is rapidly becoming the person at fault for failing to take a measure that is naturally required of them; the judiciary are now apparently willing to adjust the sentences of people responsible for causing the deaths of cyclists on the grounds that the killed individual was not wearing a helmet, a ‘mitigating factor’ suggesting leniency. This is in the absence of any evidence of whether a helmet might have had any effect whatsoever on the outcome of the collision. Coroners are also willing to indulge in idle speculation about whether a helmet could have saved the life of a cyclist who was struck and then run over by cars. Needless to say, there is never any such speculation, however well- or ill-founded, about whether crash helmets could have saved the lives of car drivers in collisions, either by judges, magistrates, coroners, or the media. Nor, as far as I can tell, are the British Medical Association, or paramedic organisations, advocating the adoption of crash helmets for car occupants, despite the fact that severe head and chest injuries are the prime causes of death for car occupants in collisions. It would seem absurd for them to do so, of course; using a crash helmet for something so mundane and everyday as using a car for everyday transport would mark you out as an eccentric. This despite the fact that the wearing of a crash helmet could – and I stress could – save the lives of car users like Toby Woolford. This entry was posted in Helmets, Horsham, Road safety, The judiciary, The media. Bookmark the permalink. The only serious bike accident i’ve been involved in (my own fault as it happens – too fast downhill on a wet road) would not have had a different outcome if i’d been wearing a helmet as I landed on my chin. I’ve got a lovely scar to show for it and took to wearing a downhill MTB helmet for a while after until I realised how stupid I was being. In most cases it’s not what you wear on your head, but how you use the brain in your head that makes all the difference. Excellent post. One day people will wake up, and realise how stupid they’ve been focussing so heavily on polystyrene hats for people on bicycles, and completely ignoring the source of the danger on our roads. I get the feeling of late that the cycle-helmet fad might have run its course. Anecdotal, of course, but I make the same bike journey to work five mornings a week, coming off-shift just before nine when everyone else is coming in, and over the past year or so I’ve noticed that several of the cycling regulars who were wearing plastic hats a year ago now don’t bother any longer. There’s little danger on the road we cycle along, it being 30mph-limited most of the way with good visibility, so what’s the point of wearing something that’s uncomfortable and a bother to carry around and makes you look a complete idiot into the bargain? Perhaps my own example is having its influence: wrinkled sixty-something who’s clearly been cycling all his life, yet is still alive = maybe it’s not that dangerous after all. It may also have something to do with the Boris Bikes: when I last looked, over six million journeys, but less than a hundred injuries serious enough to require medical attention, of which none was a head injury. The fact of the matter is that the bikes are inherently safe because they’re too slow for you to attempt anything silly like Hyde Park Corner at rush hour, and so stable that if you fall off it’ll be sideways not forwards. By the law of averages someone is going to die from head injuries one day while riding one: but by the same law someone one day will be struck by lightning , which is hardly a justification for everyone having to wear Faraday overalls winter and summer. It’s refreshing to see that in the current national debate over cycling safety begun by the Times campaign, helmets and hi-viz have featured hardly at all outside the pages of the Daily Curtain-Twitch, so well known for its love of cyclists. People seem to have realised at last that the trick is not to try and protect yourself against the consequences of collisions, but to follow the Dutch approach and prevent the collisions from happening in the first place. Essentially it’s a non-issue: there are far more important things to bother ourselves about. I have the doubtful pleasure of having to navigate Kings Cross and the Euston road occasionally, and I am under no illusion that the helmet will protect me from the cement mixers, or the vans that swerve at me. No need to apologise: when my son is cycling in London rush-hour traffic I encourage him to wear a helmet as well, on the grounds that even if the things don’t offer much protection they do still offer a bit, and in view of the risks even that little is probably worth having. 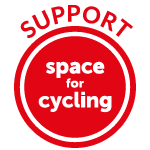 When I was up for the 22 February ride to Parliament I spoke with three regular inner-London cyclists, and each had been knocked off at least once in the past eighteen months. But as you say, the best thing is not to put yourself in danger if you can possibly avoid it. My son was near-missed a couple of weeks ago by a car rushing across a roundabout on the outskirts of Cambridge at 50mph not expecting cyclists to be there. If it had hit him then I doubt whether a helmet would have made much difference to his chances. Far wiser (I said) to get off and walk round using the foot crossings, which at least have stop-lights. “Oooh, I hope you wear a helmet!” is usually the first thing people say when I tell them that I get to work by bicycle. I’ve stopped saying “actually…” now to their assertion that helmets = safety out of sheer boredom. Thanks for a really interesting article and revisiting what I find to be a fascinating debate. I currently wear a helmet, but mainly because I’ve just got back into cycling after many years and am not yet as confident as I would like to be. However, I do feel that being a car driver of many years’ experience is possibly providing as much protection as a helmet as I know the crazy things that drivers can do and am very aware of what’s going on around me as I cycle. I can foresee a time in the not-too-distant future when I rely solely on reading the road, looking ahead and staying alert rather than a helmet. Unfortunately, it’s the unpredictability of others that makes me cautious. As an aside, recently I was the first person on the scene when a jogger was having a fit; she had fallen to the ground and was lying unconcious, bleeding from the head. No one would even have considered whether she should have been wearing a helmet (although apparently this wasn’t the first time she had suffered such an episode). Helmets for those with medical condietions, helmets for cyclists, helmets for inexperienced drivers, helmets for children?! Where might it end? Actually, I believe that there was a proposal in Japan a decade or so ago to make safety helmets compulsory for child pedestrians. It was abandoned amid universal obloquy: even for Japan it was felt to be going too far. But there’s currently a British company which is trying – without much success by the looks of it – to promote safety helmets for toddlers to wear indoors, “to prevent heart rendering incidents” according to the lady who dreamed up the idea (…and who apparently compounds the offence by writing children’s novels). I wonder what a heart rendering incident is. Perhaps she means an explosion in the cauldron when you’re boiling down a skip load of ox hearts for pet food? A man where I live wears a cycle helmet all the time even though he doesn’t have a bike. He also whoops loudly in the public library. Not for nothing are they known colloquially as spazz hats. I had a really nasty accident on the 11th March. I suffered a rear tyre blowout on my road bike as I descended a country lane. I was basically a passenger until I was thrown from the bike, hitting the road face first, rolling a couple of times and then hitting a wall. All at about 25-30mph. I was in a world of pain for two days, and was off work for a week. My neck still isn’t right now and I haven’t yet been on the bike again. I wasn’t wearing a helmet. That’s to the guy that is very much alive. I was released after eight hours with no pain killers. I was forced to return at 4am as I was crying at the pain. The out of hours doctor decided that was a good time to indulge in a lecture about helmet wearing. All she got in reply was a grunt, as that’s all I could muster. When others have heard of my accident, they’ve said “thank god you were wearing a helmet”. They just assume that as I’m still alive, I must have been lidded. Now, this isn’t a “I survived that, so you should never wear a helmet” comment. I’m still neutral on the helmet debate. I only get heated when people veer towards compulsion. I might even wear a helmet more often on new roads and I’m on thin tyres. But at the same time I know that the main reason I was off work for so long was the pain all over my body. A helmet wouldn’t have reduced that. I’ll never judge anyone for wearing or not wearing a helmet. I will judge people who tell me that I should wear one. An an unrelated story, about a year ago someone I hadn’t long met told me “you should always wear a helmet, x had a really bad accident a few months ago and is only alive because he was wearing a helmet”. Person x was there too, and was duly shepherded across to set silly me straight. He told me all about the accident, how he misjudged a corner on the way to work and hit the road with his chin. “Yes” he replied, before looking into the distance. “Thank the lord I was wearing my helmet” he said, without a hint of irony. That’s a terrible story. Just glad you’re on the mend. BTW I do wear a helmet when I’m out mountain biking, or out on my road bike, but not for ‘everyday’ cycling. I don’t suppose this is particularly logical; the helmet just seems more appropriate for a sporting activity. This is pretty well par for the course, coming from our NHS Angels: the woman behind the UK’s only compulsory-helmets pressure group BHIT, Mrs. Angie Lee, is an emphatically non-cycling (…and looks it) former nurse who has a bee in her bonnet about helmets – but over and above that, simply likes being obeyed as former nurses tend to do. I often suspect there must be an element of Obsessive-Compulsive Disorder in it somewhere: you sometimes meet characters like that in the army, people whose whole life has become devoted to enforcing the pettiest details of HM dress regulations down to and including standard-pattern tags on the ends of your bootlaces. If you’re riding a light, head-forward sports bike capable of 30mph then a helmet is probably a good idea, because you can do yourself a fair bit of damage – as you evidently did – just by coming off, with no other vehicle involved. Ditto for MTBs, where cracking your head at speed against a low branch is always a possibility. But for riding a sedate 9mph utility bike they look simply ludicrous and are a complete waste of time in any accident that’s actually likely to happen to you, like a high-speed vehicle impact from the side. As for taking a dive over the handlebars, it simply can’t be done: the bike is too heavy and the centre of gravity is too far back. If you fall off you’re going to fall off sideways, and if that happens your knee, hip, forearm and shoulder will take the impact in that order. Banging your head on the ground is vanishingly unlikely. Most of the calls for compulsion in this country come, I find, either from a few self-styled “Real Cyclists” who think everyone else should dress as they do (…and then they won’t feel quite so stupid) or more usually from archetypal Daily Mail readers who wouldn’t be seen dead on a bike, but subconsciously envy the freedom, cheapness and flexibility of cycling and would dearly love to make cyclists as put-upon and run around as motorists: not just compulsory helmets but compulsory insurance, compulsory “road tax”, compulsory hi-viz tabards and compulsory-anything-else they can think of so long as it involves compulsion. God forbid that anyone should ever be allowed to exercise their own informed adult judgement about anything! Any A&E nurse or doctor who hands me a helmet-related bollocking for anything except a head injury will soon find themselves on the end of a formal complaint to the Area Health Authority. I’m rather good at those. e ground is vanishingly unlikely. You say that you landed “face first”. And are very critical of the doctors for giving you a lecture. Yet a helmet often protects in face first injuries. The part that covers your forehead often hits first and stops the face being hit. Plus had it been just a few more degrees a helmet would have almost certainly have saved you regardless. Richard Branson recently went over the bars on a speed bump and says his helmet saved him. In MTB I have had several mates where the helmet saved them after going OTB at speed. Inc. myself. And my cousin only a month ago, helmet smashed up. Just because no one had recorded stats yet does not mean it is safe to not ride one. And it’s so stupid, because one you are used to wearing one, you don’t notice it. It’s just like one is not there! Do you really care for your vanity that much, that you will take a risk? Seems sad to me. There’s been a bit of a debate about bike helmets down here in the south west, too – see http://www.thisissomerset.co.uk/Helmets-compulsory-cyclists-says-mum-injured/story-15588988-detail/story.html for details. I personally do wear a helmet when I’m commuting to work (cyclepaths and main roads), for the same reasons as an earlier poster in that it reassures my wife (ironically, she doesn’t wear a helmet when she’s pootling around the village on her cruiser). But I very strongly feel that no-one should be forced to wear one, nor should anyone be judged for making the decision not to. The only accident I’ve had, was when I hit a dropped kerb badly and came off, sideways. Damage to arm and shoulder and knee (none of which had a helmet on them!). Twelve weeks of regular physio for my shoulder, but a helmet made no difference whatsoever! I think it all boils down to what you do on your bike – yes, if you’re doing BMX stunts, mountain biking or racing, a helmet might be useful (but interestingly “proper” BMX helmets are built to a significantly higher standard to ordinary bike hats) but I wouldn’t dream of wearing one on my roadster carrying a load of shopping! I have learned from past risk related experiences andI no longer wear flip flops when strimming the lawn! Great, sensible article matched by some equally sensible comments. I’m sharing it with friends, many of whom see fit to get cross with me if they see me without a helmet. I share the frustration that otherwise rational people suspend logical thought and let emotion get in the way of their thinking when it comes to helmets. As all the logic says it is silly to take the risk. Only vanity may try and say “there is no risk”. Good debate all, and yep, no need for compulsion with helmets. I always wear one, though, and a high-viz jacket to boot. Even pootling around Horsham on my hybrid bike. Makes me feel a bit safer, I guess. Good job I’m not too bothered what I look like……. You probably know that there is research to indicate that helmets for car occupants would be an effective way of reducing head injuries. When people talk to me about bicycle helmets I ask them what their view is of car helmets. They tend to go quiet and/or change the subject. Seems like some didn’t like your take on matters! I quite agree that a helmet is unlikely to help much, if at all, in a serious collision with a car/lorry, and I’m not in favour of compulsory helmets, but I’ve been glad of mine on two occasions when I’ve fallen off and hit my forehead on the ground (once while trying to avoid a pedestrian in the road, and once when going too fast round a corner on an icy day). On both occasions the impact was sufficient to scratch and dent the front of the helmet, and I’d rather that happen to the helmet than to my head.